Saturday Night Live ratings scored a six-year high last night! The Feb. 11 telecast, with host Alec Baldwin and musical guest Ed Sheeran, scored a 7.2 rating, 18 share in “live plus same day” household results from the 56 local markets metered by Nielsen Media Research and a 3.6/18 in adults 18-49 in the 25 markets with local people meters. The 7.2 in metered-market households is the highest Saturday Night Live ratings since Jan. 8, 2011, when the telecast hosted by Jim Carrey and featuring musical guest The Black Keys averaged a 7.8 on the night of an NFL overrun. The 3.6 in 18-49 is the strongest “SNL” rating in the local people meters since the Nov. 12, 2016 edition (with host Dave Chappelle and musical guest A Tribe Called Quest, 3.9). The 3.6 in 18-49 is also the #1 rating of the week to date in the local people meters, topping all primetime programs thus far this week. The last time NBC‘s Saturday Night Live scored a higher metered-market household rating than last night’s 7.2 on a non-NFL night was May 8, 2010 (with host Betty White and musical guest Jay-Z, 8.8). 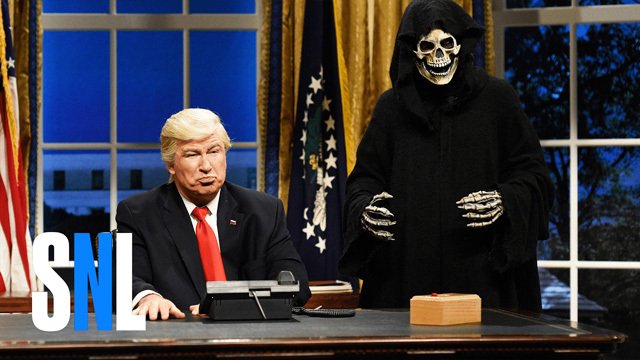 This was Baldwin’s record-breaking 17th time hosting “SNL.” The program featured Baldwin appearing as President Donald Trump, Melissa McCarthy as White House Press Secretary Sean Spicer and Kate McKinnon as Counselor to the President Kellyanne Conway. “SNL” adds significant viewership via time-shifting, with originals so far this season growing by +58% in 18-49 and +3.214 million persons or +44% in total viewers nationally going from “live plus same day” Nielsens to “live plus seven day” figures. In L+SD, “SNL” this season has averaged a 2.19 rating in 18-49 nationally and 7.386 million viewers overall, and in L+7, “SNL” grew to a 3.46 in 18-49 and 10.600 million viewers. The average 10.600 million viewers in L+7 makes this the show’s most-watched season at this point in 22 years (versus prior seasons’ original telecasts through comparable dates), best since 94-95 (10.620 million for that season’s first 11 originals). The 3.46 average in L+7 adults 18-49 rating nationally average is the show’s best performances in the demo at this point since 2008 (4.26 for that season’s first 13 originals).